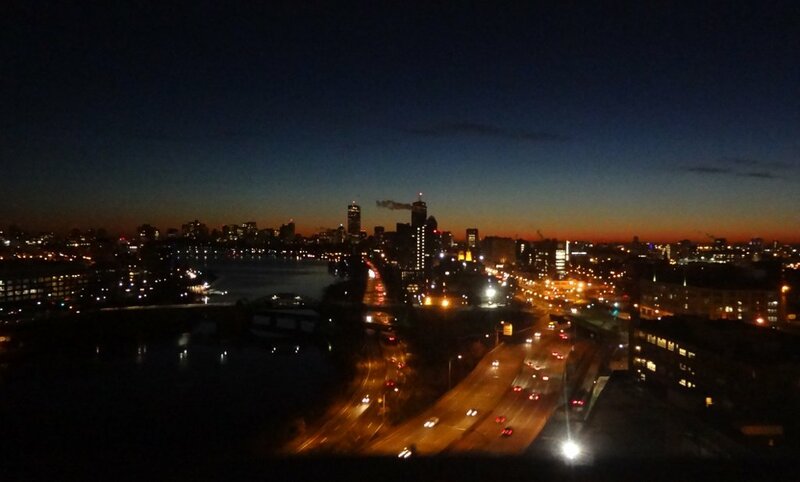 Steven Ganeles watched the sun come up around 6:30 this morning from 10 Buick St. Click on the photo for a larger version. Good news; since yesterday (Sunday, 12/18) was crystal clear to the southwest, I can report that sunsets are getting later, even before the official solstice. It's a little known fact that the winter solstice is NOT the date of either the latest sunrise or the earliest sunset. The earliest sunset was actually about 10 days ago, at 4.11pm. Sunsets have been getting later since. (4.13pm tonight!). On the other hand, sunrises are still getting later and will continue to get later until approximately New Year's (when they will hit 7.13am; this morning it was 7.08). It's just that (as I understand it), the rate of change of sunrise and sunset is such that the shortest day (i.e., shortest time between sunrise and sunset) is the solstice, even though it's not the earliest sunset or latest sunrise. In the summer, it's flipped, so that the latest sunset isn't until 10 days or so after the summer solstice. Can anyone explain why this is so? I've never quite fully understood; I've only know that it is so. Because all that science mumbo-jumbo is a liberal conspiracy and the sun comes up whenever Jesus wants it to. This site does a beautiful job of explaining it. Just keep clicking through.